Dr Brown said, “I issue this statement today in expectation of the release of the Commission of Inquiry report, which was due to be delivered to the OBA Government yesterday. “When the Commission was first introduced to us, it was clear that it was being established as a tool of the OBA government. Its very composition reflected the historical racism of colonial Bermuda. “In 2016, the steadily decreasing Black population of Bermuda remained a majority of the population. 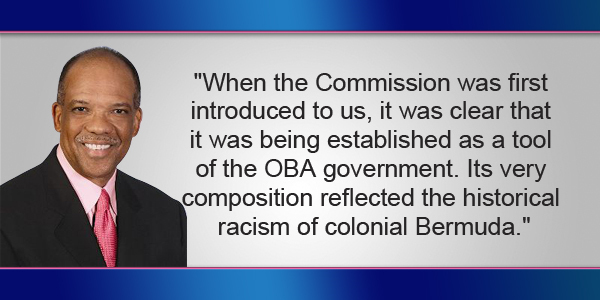 Yet, the Commission included only one Black member and was not represented by a single Black learned member of the Bermuda Bar. “That, in my humble opinion, was an insult to the Black community. Visually, it was quite a disgusting spectacle — Black people being called before White masters to answer for some presumed skulduggery. It was truly reminiscent of the worst days of our history in Bermuda. “The major purpose of the Commission, contrary to its stated raison d’etre, was to create a cloud of uncertainty over the PLP by subjecting former PLP leaders to a court-style inquiry into matters that were eight or nine years old. “There was no look into any history of the UBP/OBA activities at all. We should all agree that violations of Financial Instructions should not be dismissed as unimportant, but they did not start with the PLP, and they did not end with the PLP. “Violations are regrettable, and should be corrected. But, I do not believe that they needed to be explored via a Commission of Inquiry at a cost of over $1 million to the Bermuda taxpayer. “Some might recall that when this issue was raised during my tenure as Premier of Bermuda, I suggested that if there was to be a review of past conduct, it should cover the immediate past 14 years of the UBP/OBA administrations and the most recent 14 years of PLP administrations. It seemed only fair, but was not to be. After all, that would not aid the OBA in the General Election! “Instead we have been treated to a circus with consequences, where former Black ministers and civil servants were questioned in a style more reminiscent of a court prosecution. It was a shameful display! “Before any relevant evidence was even discussed, Chairman Evans made the summary judgment and headline that the events at Port Royal Golf Course were “straightforward fraud”! “So, unfortunately, what we will receive from the COI will not be balanced, because it was not conceived in a spirit of fair play, and it was not conducted in an atmosphere of impartiality. “Simply put: The COI was contrived to cast aspersions on the character of past PLP administrations in order to influence the upcoming election. “The themes associated with Black people — suspected criminality and corruption — will be memorialized in print by the report. There will be no surprises. “I can reasonably predict that I will be castigated as will others. Bermuda will join Caribbean neighbors to our South in having Black governments accused of possible criminal activity, while White-controlled governments sip tea and plan for casinos and sailing spectacles that include Black people, for the most part, in serving and entertainment capacities. It is a sad day in Bermuda. “But, it is also another day when this OBA Government will show its wicked hand for everyday people to see — another day when we can resolve that we will not be deterred by those who accuse us and people we know of the very venality they themselves possess.